We're kind of a big deal (Anchorman anyone?) and sometimes people like to write about us! We'll keep this page updated with new articles to share with you. The Red Kuri squash in the box two weeks ago was the best squash I've ever tasted! I'd never heard of it before, but sure will watch for it in the future! Thanks for the treat! 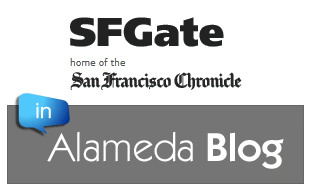 OAKLAND, Calif. -- ALAMEDA, CALIF. – Well into its second year of business, veteran owned Golden Gate Organics is known in the East Bay as the premier grassroots organic produce delivery service. Throughout the East Bay and San Francisco you will find happy customers raving about their friendly service and premium organic produce. Now that they are delivering Bernie’s Best Apple Ciders their environmentally and locally focused customers have another reason to cheer them on. Bob Bernstein, known by Berkeley Farmer’s Market patrons since the 1970’s as “Bernie”, is the sole owner of Pomo Tierra where he works tirelessly year-round making his niche apple ciders. For over thirty years he has been a staple of the Berkeley Farmer’s Market. All of his cider’s are locally made in Yorkville, CA from apples on his organic orchard and all of his ciders are USDA certified organic. For the first time ever Bernie’s customers can get his ciders delivered to their East Bay homes and offices. "Alameda-based Golden Gate Organics, a new organic produce home delivery service out of Alameda, is expanding to Walnut Creek and Pleasanton. The company delivers only 100 percent USDA-certified organic produce to homes and small business throughout the East Bay. The company does not charge upfront fees." "At the Webster Street Jam this year, we (meaning my family and I) spotted a stand for Golden Gate Organics, which appeared to be just another organic fruit and veggie delivery service. But their stand was appealing and they were giving out free fruit so we stopped in for a chat. 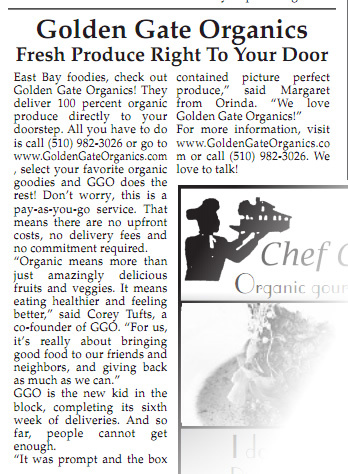 Turns out, Golden Gate Organics, despite the San Francisco sounding name, is actually based in Alameda. 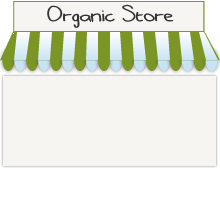 So I sent them some questions about their business, so that In Alameda readers could get to know their local organic produce delivery service. Oh, and we are super happy customers now too after signing up for their service at the Jam." ALAMEDA, CA -Golden Gate Organics delivered its first set of organic produce boxes on Tuesday, July 5. After completing a local deal through online coupon site LivingSocial, over 800 new orders were received, 600 of which were made in the first six hours. The premier organic produce delivery service wants to make buying organic and locally-grown produce easy, affordable and convenient for everyone. "By choosing our service, customers get a greater selection of 100% USDA certified organic fruits and veggies, and receive them up to five days sooner than that of a grocery store,"said Corey Tufts, Golden Gate Organics owner and founder. "On top of that, you have the satisfaction of knowing that the produce you are eating is as local and healthy as possible."